Sometimes living in my imagination is difficult. Do you know what that means, to have a vivid imagination? For me, it means that what I “experience” in my head is often as real or more real to me than things that I experience in real life. Having gone through the deaths of people close to me, I know that there is a time in death when people rewind or remember their lives as if they were living them again. One gentleman I know who was a carpenter, as he got closer to death, they said he had “started building again.” He was building houses and furniture that he had actually built in his lifetime, recalling details about things he had built many years before. My grandmother did something similar, recounting details of things that had happened in her life some 65 years before her death. So I know that the brain “works backward” through its memories when you die. That’s why I’ve warned my kids that when I get to that point, many things I talk about may or may not have really happened because so many things that I have “experienced,” weren’t really in my real life experience, they were things that happened only in my head. I have had stories that I wrote that I would pick up to continue writing years after I wrote the initial book, and my mind would fill in details I could not possibly have just “remembered” 5 years later. A character who always refers to his grandmother as “Beautiful” as if that is her name—and I wrote that four or five years before and write it into a new scene without reading over what I had previously. Strange things like that. A room off to the side in a church that I wrote in book 3, and sure enough, that room was written in the original book (that I hadn’t gone back to reread when I wrote that part)—except that church really doesn’t exist except in my mind. What is that? I don’t know. I don’t fully comprehend how I do what I do. I just know, for me, that is life. And so it is with this new series that has just gone on preorder. It’s called “The Imagination Series” because so much of it revolves around characters with “abilities” that I think most of us either don’t have or don’t know how to access. 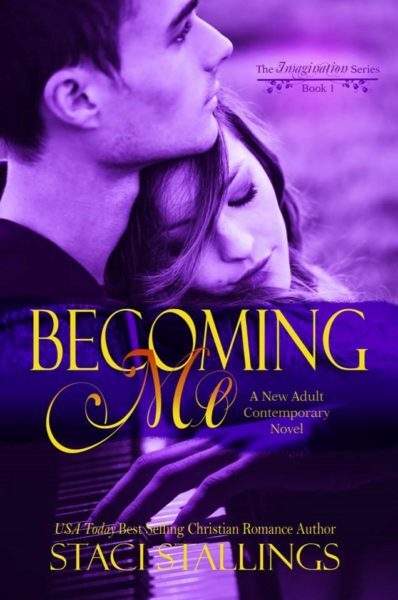 In the first book “Becoming Me,” for example, Nelson Samuels, the hero, hears music—melodies all the time in his head. He has learned how to capture them—on a piano, a guitar, the drums, etc. His friends all think that he “writes” music, but much like I do with my stories, it is less about him creating something as him trying to capture something that only he hears. The heroine, Paige Grayson, does the same thing except her imagination expresses itself in words. She writes poetry. Words about how she feels and about life as she is experiencing it. Neither of them have ever really told anyone about these gifts because they know others probably will not understand. It is much like me, trying to explain what it’s like to live with an imagination like mine is a big challenge because, honestly, I know without asking that other people will think I’m weird (and I just don’t want to go there although I’m getting braver and braver about sharing that part of me as I go). Two things come to mind as I think through this whole imagination and what it means and what it can mean for the one with the imagination and those around that person. I’ve mentioned before my obsession with “The Greatest Showman,” and I think this discussion is one of the reasons I love it so much. PT had an amazing imagination and the courage to try to put that imagination into real life. In one line in the movie, Phillip says: “They come to see you—the crazy acts you come up with.” It was because PT could imagine things that had never been seen before that he could unlock the human potential of those around him. The second is an experience I had the other night. My son and I went to see “Paul, the Apostle.” To say that movie is brutal is, for me, an understatement. Watching the movie was an extra credit assignment for my son, and so we went. I don’t know that I had really thought through what the movie might be about, but two things should have clued me in: 1) Paul was in jail and I knew that was part of the movie, and 2) Jim Caviezel was in it and had produced it in the vein of “The Passion of the Christ.” So to put it mildly, it didn’t pull many punches. And there were several other incredibly brutal things just like that. They didn’t show it, but if you know enough about the history of that time, you know what happened, and for me, it matters little that I was covering my eyes (yes, literally!) because my imagination helpfully fills in all the details with things I didn’t “see” in my own experience with things that I did “see” only in my imagination—sometimes that might be good, other times it might be far worse. So, I guess I just wanted to share with you some of how this new series came into being, some about me as an author and person, and some to explain what the word “imagination” means to me and why I chose that as the name of this series. I do hope readers enjoy reading it because honestly this one has challenged even MY imagination because I’ve had to tap into my characters’ imaginations to be able to write it. I hope it will challenge my readers to think in terms of the strengths of their own variant of imagination and get a little braver about using it, sharing it, and calling it out in others. This is your chance. Get a jump on everyone and preorder this one today…. This new series sounds like a good One! Looking forward to it! Thanks, Paula! I sure hope everyone falls in love with these characters as I did. God bless! i too have a very vivid imagination. sometimes it is a hindrance, sometimes it is wonderful. like when i use some of this for quilting or making greeting cards. i understand about those people getting close to death. my mom did this and now my dad is going through it. so difficult to see, but all we can do is encourage him and keep things light and happy. with God’s help we are keeping him on Gods mind set. I am learning to make peace with my vivid imagination. Prayers for your family situation. Losing those close to you is really, really tough! This sounds like a wonderful new series. I don’t have much of an imagination so it’s great to be able to tap into other peoples’. I think that’s why we read and listen to music. We get to tap into someone else’s imagination! Hi Staci!Thanks for sharing. Imagination is a powerful asset for writers, artists, musicians, crafters, cooks, bakers, and more. We all have imagination to some degree, because I watch imagination at PLAY in my grandchildren when they reinvent or reuse toys for other purposes. Best wishes and happy writing. Probably my training ground was making up stories with my Barbie dolls. Did that for many, many, MANY hours! I can relate to your imagination. Mine is also very strong, and I can’t handle those kind of movies either, among other things. I really enjoyed reading your post! I can’t watch movies like that as I remember too much for too long. I’m creative with sewing and can see things and make them in my head. Sometimes I make them several different ways in my head before I pick the best one and actually do it. That’s cool. I’ve sewn in my lifetime, but I couldn’t come up with how to sew it in my head. I had to stick to patterns! It sounds sooo good! I love how you let us see the side of you not many would understand. I’ve always been interested in how authors write their books; where they get their ideas from, and if they have ideas and conversations floating around in their heads. Thanks for being so transparent with us! God bless!